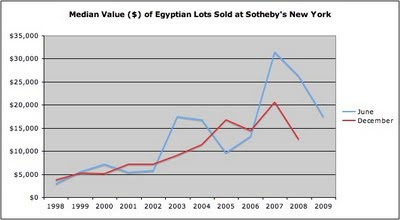 In December 2008 I presented a chart showing the median value of lots of Egyptian antiquities sold at Sotheby's New York. I have updated it in the light of the June 2009 sale. The trend seems to be firmly downwards. 66.7% of the Egyptian lots sold since 1998 were first known after 1973.